Jenny Balfour Paul, indigo authority and author of Deeper than Indigo, with Peter Harrigan, Director of Medina Publishing, outside Smedmore House. 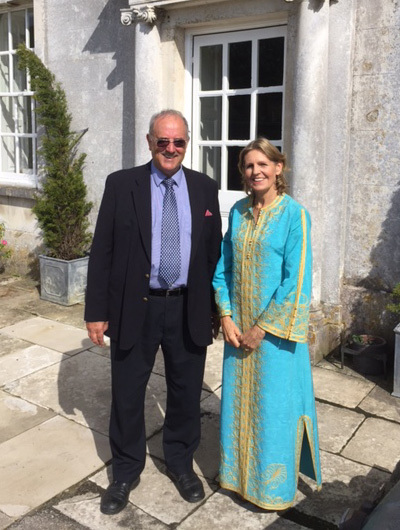 A capacity audience of more than 75 filled the rooms of Smedmore House in Dorset on 24 June 2016 for an oriental evening in aid of charity. As well as an Iranian buffet, the evening included a talk by Jenny Balfour Paul on her life’s work with indigo and her latest book, Deeper Than Indigo (Medina Publishing) and a performance of eastern music on a 96-string santur by Iranian musician and composer, Peyman Heydarian. In welcoming guests, charity patron Lady Sally Grylls explained that funds raised during the evening were being donated to Dorset’s Admiral Nurse campaign as part of an initiative by Dementia UK. Historian and author Philip Mansel attended the evening in his family’s historic home. His latest book is Aleppo: The Rise and Fall of Syria’s Great Merchant City.